Federal experts say the Colorado toad has the same DNA as all the other toads in the western states, but the Colorado folks have their own endangered species. According to the article, habitat loss from timbering, grazing, recreation, and water projects accounted for isolated cases (of toad deaths). In the mid-seventies scientists were seeing the toads disappear from sites and not return. In 1994 the Colorado Department of Wildlife formed a recovery team that conducts annual surveys of this high altitude toad population. For 16 years aquatic/herptile coordinators have been trying to help the toad recover. The results have been discouraging. Reintroduction efforts at 20 different sites in the state have failed to produce breeding adults, and scientists still barely understand the chytrid fungus that is wiping the toads out, except that it spreads easily with human activity. Hello!!! When the fungus was identified in the late 1990s, officials believed they could fight it, but it proved more insidious and mysterious than believed. First let’s be sure we know what is meant by reintroduction. We have one last (known) site in Colorado where the toads are struggling, but surviving. In an effort to reintroduce this endangered species into 20 different sites in Colorado, we gather up multiple toads from this one site where they are still reproducing, insert a microchip into their little backs, and cart them off to 20 different places to get a new start. In sixteen years we have failed to find breeding adults within these 20 reintroduced sites. It is fascinating to note how often environmentalists, in this case an aquatic/herptile coordinator with the Colorado Department of Wildlife, make reference to experts, scientists, and officials who are lurking in the shadows. In the above half-page article, the only suggestion of supportive data is from the federal government, which states that the DNA of the Colorado toad is the same as that of all the other western states. Still unnamed experts, scientists and officials lend credence to each story line, almost always with no reference to any supporting documentation. It seems possible that the agent of this little toad’s destruction might easily be the environmentalist (aquatic/herptile coordinator with the Colorado Department of Wildlife) who follows standard instructions on how to reintroduce toads from where they live to places where they don’t live. As part of these instructions somebody inserts a microchip in the little guys backs, transports them to strange lands, and expects them to reproduce where they have never lived before. Sound like a viable plan? This plan was tried with the Jamestown species 500 years ago, where half of all transplanted humans died the first year. That, of course, was without the microchip, experts, scientists, and officials in the background. As a scientist, it is given that environmentalists never work with a population. They work only with samples, small, isolated, limited samples. From these extremely limited samples, they make mighty extrapolations from their samples to the population as a whole. In the present case, the timeline of the toad’s destruction originates from observations of scientists from the 1970s. Based upon this information, there is zero objective evidence that the poor little toads are any better, or worse off than they were forty years ago. Neither is there any evidence that this endangered toad is any different from the millions of other toads in the western states. Playing to the fears of any readers, the idea that a single muddy tire can finish off the entire population of toads in Colorado is offered by our aquatic/herptile coordinator. To this could be added the muddy boots and rubber gloves of Department of Wildlife coordinators, who scour through their last remaining stronghold gathering up those toads they can find and cart them off to places where they have never lived before. Is it any wonder the toad “population” is vanishing in Colorado? Hello!! 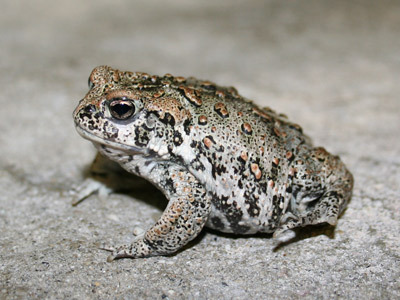 Does the Colorado Department of Wildlife even have an estimate of the size of the endangered boreal toad’s population? Is this endangered toad any different from those other toads found reproducing satisfactorily throughout the other western states? Why not leave the poor toads alone, and concentrate on reintroducing wild horses. Woops!!! We already have government scientists doing that. Would somebody please explain to me how a microchip, implanted into a four-inch toad’s back, helps track its health and prevent it from dying from a common fungus? Sorry little toad. I am from the government, and I am here to help. I have a plan! Let’s implant microchips into Department of Wildlife aquatic/herptile coordinators backs so we can track their movements and be sure they stay clear of all endangered toads’ habitats, assuming that we actually have an endangered toad in Colorado. On a recent trip to Colorado a little sign was posted prominently just east of Lyons which stated “Keep Out! Prairie lands in this area are being restored” I pondered exactly which experts and scientists were in charge of this restoration? How would we know when the restoration was complete? The only ones forbidden from entry were those who can read. All others are welcome. This is an environmentalist’s nirvana. Man, excepting environmentalists, are not allowed. Muddy tires are not OK. Muddy boots, rubber gloves, and microchips are fine??? I wish somebody would explain all this to me.